Trader Joe’s sells packages of organic chicken drumsticks for about $3.30. That yields two meals. This week I made the absolutely best chicken drumsticks I’ve ever had using a Cajun Seasoning spice sent to me by Aviva, who lives in the New Orleans area. This Cajun Seasoning spice blend includes salt, garlic, red pepper, paprika and green onion. This meal is silly simple and at $1.65 per portion, it is also very affordable. And I used organic chicken. If you decide to use conventional chicken you can make this dish for under a $1. 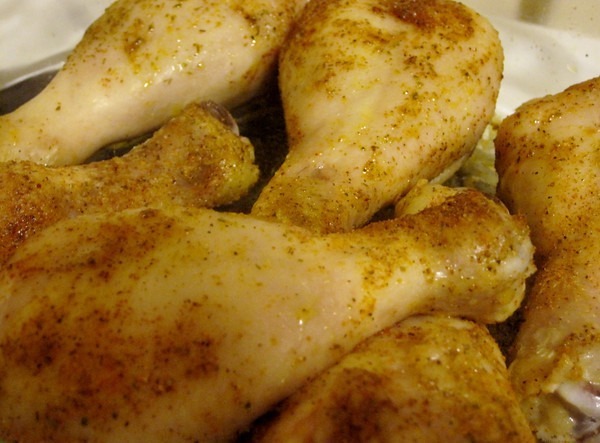 Pour some olive oil or melted butter on thawed chicken. Add Cajun Spices to the chicken. You can rub it in if you like. Put chicken in oven. Let it go 10 minutes and then drop the heat to 350. My oven takes about 30 minutes before the internal temperature of the chicken hits 160 degrees. Remove from oven. Let it cool for a few minutes and then serve. My side dish was steamed broccoli with a little butter. gotta love it when you can be healthy AND affordable! So glad you put the spices to some good use. I’m curious to hear about your favorite of the bunch. Those look yummy, I’m most definitely going to make them. The one I used for this recipe was “Cajun Land”. It was a HUGE hit!!! I almost didn’t make enough for how fast it was going (14 legs for 3 people – we are oinkers!) and I did a side of steamed green beans. They said it was super-filling and didn’t miss having bread with the meal 🙂 Just wanted to say THANK YOU for posting these recipes … up next: taco meatloaf, probably this weekend! @Sheri – As your comment came in I was eating leftover Cajun drumsticks. Glad you like the recipes. Hope to have more out this year.